When approaching Zion National Park from either the south or the east, stunning mountains of sandstone rise in solitude and silence. The rock scene in Zion gathers like a stone fortress, forming one of the most spectacular National Parks of all time. Uplift, erosion and other geological factors have, through time, unintentionally made a hikers mecca in Zion. From the classic trails, along the six-mile road into Zion Canyon, to the routes found along the exciting and spiraling Zion-Mt Carmel Highway, few places can compare. Combine the scenic drives with hiking trails for an exceptional trip. Hiking in Zion raises this park to a level that astounds! 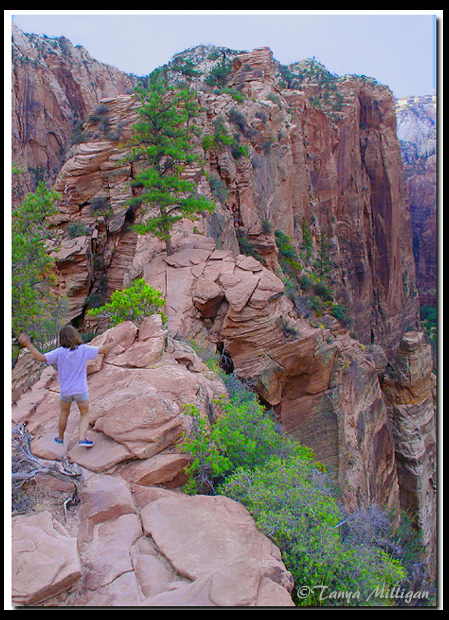 Angels Landing is one of the best trails in the National Park System. It's just daring enough to make thrill seekers happy, yet tame enough that the trail sees a line of hikers throughout the day. The scenic drive along the Zion-Mt. Carmel Highway, through Zion National Park, is reported to be the highlight of their tour through the Southwestern parks by many who vacation in southern Utah and northern Arizona. This highly scenic road traverses through the great basin desert into a picture perfect oasis. The views along the red graveled road are spectacular. Do not miss Checkerboard Mesa with its almost symmetrical display of squares etched along its entirety. Other landmarks include: the Beehives, East Temple, Sentinel, Great Arch as well as various whimsical shaped hoodoos along the east side of the Zion-Mt. Carmel Tunnel. Keep your eyes open for Big Horn Sheep in this area. These elegant creatures are increasing in number and families and groups of them are now often spotted from the highway. 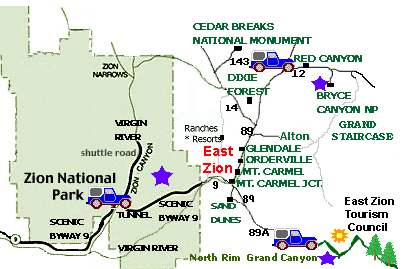 Also on many visitors hot list is often the shuttle trip into Zion Canyon. Make the time to drive this 6-mile section of road during the winter, when the shuttles are not running. This section of road is gorgeous, but it is difficult to see the full view from inside the shuttle. However, anyone is free to get out at any shuttle stop and walk along Zion Canyon Drive or the beaten paths along the North Fork of the Virgin River. The Zion Canyon Shuttle does make several stops so passengers can get out and explore short walks to view points overlooking the scenery of Zion Canyon. For many, hiking is what Zion National Park is all about. The trails in Zion are incomparable and there is no better way to see the park than on foot and winding through the many spectacular trails. In Zion there are trails from everyone ranging from easy paved wheelchair accessible trails to route for climbers who make their way up the smooth sides of Zion's greatest mountains. Make sure to include: Canyon Overlook, East Rim, Angels Landing, Weeping Rock and the Zion Narrows during your stay. Few avoid the refreshing spray, when walking beneath the misty waterfall, along the lower trail. Orderville Canyon is incredible, especially the lower three miles. Enter the Canyon while hiking the Zion Narrows or from East Zion. The spectacular Zion Narrows is a must any time the temperatures soar in Zion National Park! A short and fun trail to a seepage area. To cross over to the alcove at the end, you will be refreshed with dripping water. Sections of Echo Canyon can be seen when hiking the East Rim - Observation Point Trail. You cannot miss the Virgin River that carved Zion Canyon. The Sacred Datura is a plant that is seen throughout Zion National Park. It is quickly recognized by its display of white funnel-shaped flowers. The flowers close in the heat of the day and bloom at night and early morning. Although the plant is poisonous and can cause hallucinations, convulsions and even death, it is thought that the ancient Indians used parts of the plant in their religious ceremonies. Sacred Datura even today, has religious meaning to many Native Americans.